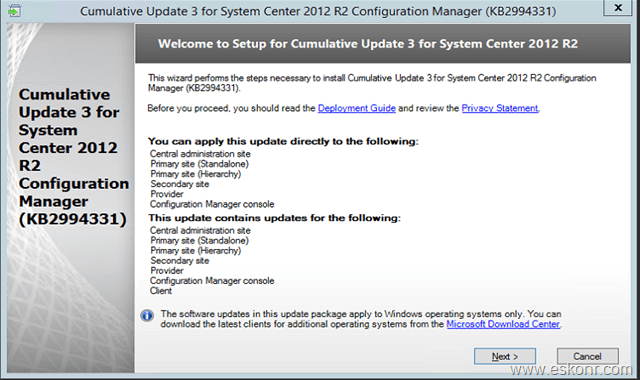 In this post, i will discuss about how to install CU3 update and How to Upgrade clients to CU3 with query based collections. So,as i discussed in my previous post about the CU3 update : it contains many bug fixes with respect to Powershell and other Site server and client functionalities including 3 important new changes to this update. 2) Child sites may perform partial WSUS synchronization when the primary is under heavy load. This partial synchronization occurs when the WSUS Synchronization Manager component on a primary site begins synchronization before WSUS has completed processing all updates metadata. So before we start,try downloading the CU3 update from http://support.microsoft.com/kb/2994331 and extract it. After you have the file,try to run with file with administrative permissions. As you can see from above screen,you can install CU3 on CAS,Primary,Secondary,SMS Provider and Console. The Installation procedure is straight forward , but make sure you don't have any reboot pending while installing this CU ,also close any administrative consoles open which are connected to the SMS provider. 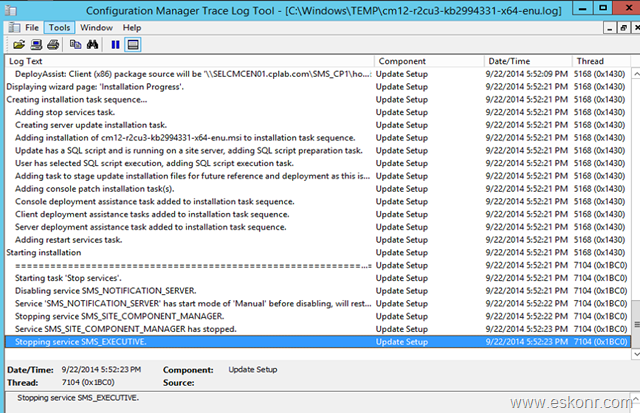 Log will be created under C:\windows\temp\cm12-r2cu3-kb2994331-x64-enu.log with CU3 installation progress. Check your Console if it is updated to Right version or not. After you are done with the installation of CU3, you are need to distribute the CU3 packages (Console,Server,X86 and X64) to Distribution points . 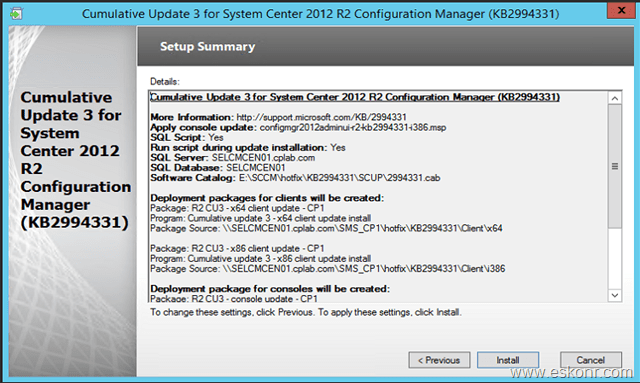 and next ,create collections to upgrade the clients which are lower version < CU3 version but >=R2 to CU3. I did not discuss about installation of CU3 on secondary site servers on this blog .If you are having multiple secondary sites,you can create collection by referring to my old blog post or you can install CU3 patch called : R2 CU3 – Server Update package manually. Note: you can install this Update only on clients which are running on CM12 R2 + any Cumulative update but not on any other versions. select SMS_R_System.ResourceId, SMS_R_System.ResourceType, SMS_R_System.Name, SMS_R_System.SMSUniqueIdentifier, SMS_R_System.ResourceDomainORWorkgroup, SMS_R_System.Client from SMS_R_System inner join SMS_G_System_ADD_REMOVE_PROGRAMS on SMS_G_System_ADD_REMOVE_PROGRAMS.ResourceID = SMS_R_System.ResourceId where SMS_G_System_ADD_REMOVE_PROGRAMS.DisplayName = "System Center 2012 R2 Configuration Manager Console"
This will list all configmgr Clients with criteria : should include X86,Client=1,Client <CU3 (5.00.7958.1401) and client version >= R2( 5.00.7958.1000). select SMS_R_System.ResourceId, SMS_R_System.ResourceType, SMS_R_System.Name, SMS_R_System.SMSUniqueIdentifier, SMS_R_System.ResourceDomainORWorkgroup, SMS_R_System.Client from SMS_R_System inner join SMS_G_System_COMPUTER_SYSTEM on SMS_G_System_COMPUTER_SYSTEM.ResourceID = SMS_R_System.ResourceId inner join SMS_G_System_SMS_ADVANCED_CLIENT_STATE on SMS_G_System_SMS_ADVANCED_CLIENT_STATE.ResourceID = SMS_R_System.ResourceId where SMS_G_System_COMPUTER_SYSTEM.SystemType = "x86-based PC" and SMS_G_System_SMS_ADVANCED_CLIENT_STATE.DisplayName = "CCM Framework" and SMS_G_System_SMS_ADVANCED_CLIENT_STATE.Version >= "5.00.7958.1000" and SMS_G_System_SMS_ADVANCED_CLIENT_STATE.Version < "5.00.7958.1401"
This will list all configmgr Clients with criteria : should include X64,Client=1,Client <CU3 (5.00.7958.1401) and client version >= R2( 5.00.7958.1000). select SMS_R_System.ResourceId, SMS_R_System.ResourceType, SMS_R_System.Name, SMS_R_System.SMSUniqueIdentifier, SMS_R_System.ResourceDomainORWorkgroup, SMS_R_System.Client from SMS_R_System inner join SMS_G_System_COMPUTER_SYSTEM on SMS_G_System_COMPUTER_SYSTEM.ResourceID = SMS_R_System.ResourceId inner join SMS_G_System_SMS_ADVANCED_CLIENT_STATE on SMS_G_System_SMS_ADVANCED_CLIENT_STATE.ResourceID = SMS_R_System.ResourceId where SMS_G_System_COMPUTER_SYSTEM.SystemType = "x64-based PC" and SMS_G_System_SMS_ADVANCED_CLIENT_STATE.DisplayName = "CCM Framework" and SMS_G_System_SMS_ADVANCED_CLIENT_STATE.Version >= "5.00.7958.1000" and SMS_G_System_SMS_ADVANCED_CLIENT_STATE.Version < "5.00.7958.1401"
Now you have packages and collections ready for deployment .Deploy the CU3 package to respective Collection to upgrade the clients to CU3 level. Monitor the report for the the Deployment status . 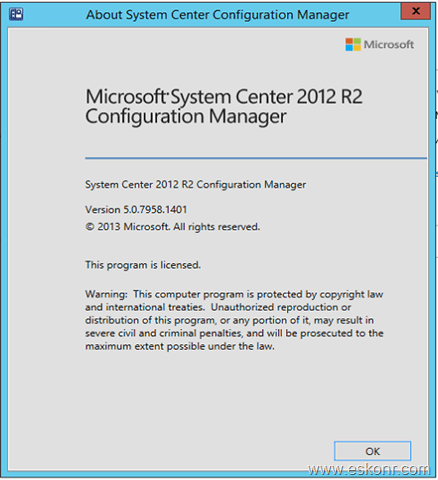 One Response to "How to Install and upgrade clients to Configmgr 2012 R2 Cumulative Update 3 (CU3)"